Healthy Koi have just introduced Gift Vouchers in a range of values for the purchase of their services or products. For those of you who are looking for that special present, the Gift Vouchers are available in £5, £10, £20 and £50 units and can be used for the purchase of items from Healthy Koi up to the value of the vouchers. Alternatively, they can be put towards items which cost more. The vouchers are valid for 12 months from the date of issue and can be used for any of our services or goods in our shop. The vouchers can also be used on our internet site via contacting us but postage costs need to be taken into account for some items. With Christmas arriving shortly, now is the time to surprise that special person with a Koi related gift. Should you need any help or you require any further information or assistance, please do not hesitate to contact us. Healthy Koi are pleased to announce a their product special for items linked below. Product numbers are limited and will only be available until stock runs out. Healthy Koi are pleased to have been invited to give a health related talk to the Suffolk and North Essex Koi Club. The talk will take place at the Stanway Rovers Football Stadium in New Park Road, Stanway near Colchester (CO3 5PG) at 7.30pm on Thursday 5th November, 2009. The talk will be a continuation of the seminar given about two years ago and will cover “Recent advances in fish disease detection”. The talk will be on an informal basis and there will be plenty of opportunities for questions during the evening. A small trade table will be set-up at the venues for the seminar. This will display some the range of our products. You will be able to see the new Hanna 83203 (Hi- 83203-02) multi-parameter photometer for water testing which has superseded the former C203 instrument. There will also be a range of medications, disinfectants, air pumps, water purifiers and many other useful products. If there is anything you specifically require, please let Healthy Koi know in advance on 01243 698284 or 01243 572762 and they can bring it along to the meeting. Should any non-club members wish to attend, please do not hesitate to contact Colin Bond on 07787 563380 as new/ prospective members are always welcome by all. Healthy Koi have just increased their range of pond protein skimmers. We can now offer the superior Clarity protein Skimmer which can help to create optimum water quality conditions in your pound. The Clarity Skimmers works on removing Ammonia, Nitrites, Nitrates and Phosphates – it also removes the dissolved organic compounds through foam fraction leaving the water sparkling clear. Within this process your pond water is also aerated. 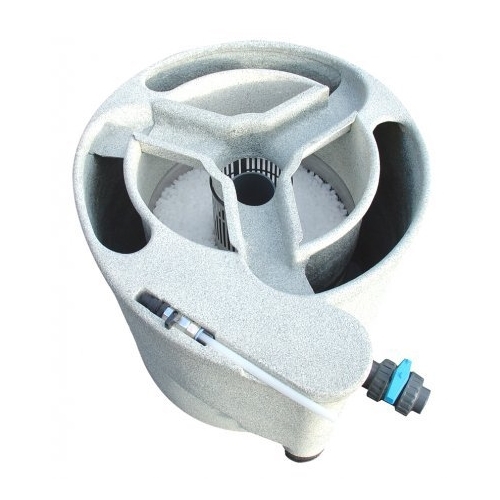 The beauty of the Clarity protein skimmer is that by removing phosphates and nitrates, it minimizes blanket weed blooms that all koi keepers experience and dread. The Clarity protein Skimmer is the preferred choice for removing the organic waste from water. High levels of DOC are undesirable in the water because it leads to less oxygen, more bacteria, algae and parasites. It also results in a build up of ammonia, nitrite and nitrate, which has damaging effects on Koi.Many protein skimmers struggle to work effectively in freshwater. Salt water has a greater density which allows finer air bubbles to be created, The smaller the air bubbles, the larger surface area over a given volume of pondwater. This allows the Protein Skimmer or Foam Fractionator to be more effective in removing DOC. The Clarity protein skimmer is based on an entirely different approach to form bubbles, and therefore does not have the limitations in fresh water associated with traditional protein skimmers. It’s a protein skimmer that works in fresh water and does not pressurize the water. With glowing recommendations from many leading Koi keepers worldwide, this skimmer is a worthwhile addition to your pond. Visit our product page for further information. Healthy Koi are pleased to have been invited to give health related talks to three Koi clubs this autumn. We undertake these events in both the spring and autumn to help improve the health and welfare knowledge of the Koi hobbyist. They are enjoyed by all who attend. The ‘general’ seminar will cover all aspects of Koi Health including disease diagnostics and recent developments in testing technology. The specific ‘’Advances’ talk will go into the changes in greater depth. A small trade table will be set-up at the venues for the seminars. This will display some the range of our products. You will be able to see the new Hanna 83203 multi-parameter photometer for water testing as well as a rage of medications. If there is anything in particular you wish to see, please let Healthy Koi know in advance on 01243 698284 or 01243 572762 and they can bring it along to the meeting. Should any non-club members wish to attend, please do not hesitate to contact the representatives shown above as new/ prospective members are always welcome by all. Healthy Koi are pleased to announce that they will again be attending the South East Koi Show this year. Reputed to be one of the UK’s top Koi shows, the South East International Show will be held at Parkwood Hall School School, Beechenlea Lane, Swanley, Kent. BR8 8DR on Sunday & Monday, the 30th & 31st August, 2009. The Show, which opens to the public from 0930am until 5pm, will host an exciting range of Koi trade stands and well as an arena full of stunning Koi. In addition to our usual range of items, we will this year be having an extended display of Hanna electronic water testing equipment and accessories. You will have the opportunity to look at the new Hanna 83203 multimeter with improved accuracy. In addition to the single and multi-parameter testing equipment & reagents, we will be displaying a range of hand held Hanna dip meters which are both inexpensive and easy to use. To make testing even easier, take time to talk to us about the provision of a ‘Continuous Reading’ meter. During the Show, our enthusiastic and friendly staff will be in attendance on the stand to help you with any queries that you may have on Koi health matters, testing, care, welfare and Koi diseases. Our stand, which will be located in the West Marquee, will include a full range of Koi health products including a new range of top value second hand serviced microscopes, medications, topical treatments, swabs and many other interesting items. Should there be any specific items you are interested in, please do not hesitate to give us a phone call on 01243 698284 or 01243 572762 in advance and we will ensure that these will be available for you to look at on show day. There are several eye infections caused by bacteria and fungi that can turn the cornea opaque. In addition the eye can be traumatised by pond conditions and injuries. Such infections are often referred to as cloudy eye as though it was one single disease which is not the case. Clear Eye Lotion can help with some infections. In mild cases a drop of Clear Eye Lotion can be dripped onto the eye directly but in severe cases a cotton wool ball or cotton bud soaked in the lotion should be gently used to bathe the cornea. This can be repeated as often as the fish tolerates handling but at least twice per week. Use a clean cotton wool ball or pad for each eye and treat both eyes at the first treatment even if only one appears affected. In addition, When working close to the eye, we usually coat the eye with ‘clear eye’ to protect it from any adjacent stray coatings. Healthy Koi has increased their range of Koi food to include the Dia Suki Goi brand. Introduced to complement the range of foods which we offer, Dia Suki is an affordable well balanced quality diet which the Koi find very palatable. The food is available in ‘All Seasons’ (wheatgerm), a ‘Staple’ diet and the high growth Dia Suki ‘Gold’ for use in the summer when our pond water is above 18 deg.C. Pellet sizes available are 4mm, 6mm & 11mm depending upon the container size and the type of food selected. The food will be available in 1Kg, 2Kg, 5kg & 10Kg buckets and the cost saving 20Kg sacks. Should you require any more information about the food, please do not hesitate to contact us. Healthy Koi have just increased their range of pond water testing instrumentation available. It will help to make life easier for both the professional and hobbyist fishkeepers to keep their water quality excellent and their fish disease free. Continuous monitoring, wall mountable meters have now been added to the already impressive range of water testing instruments, which include the popular Hanna C203-2008 multi parameter meter and other hand held meters and dip testers. These new meters allow continuous monitoring of a lake, pond, tank or aquarium and provide the information you require in just a glance. A diverse range of models are offered to suite all budgets, including simplified models for testing a single parameter, up to more professional equipment that allows accurate testing of multiple parameters and displays them simultaneously. Made by Hanna Instruments Ltd, the continuous monitoring instruments starts with the basic wall mounted pH meter at £70.00 up to the Hanna Combo HI 991405 series Conductivity/ TDS/pH/ Temp meter at £172.50. The wall mountable Hanna meters are designed for continuous, high accuracy measurements. These microprocessor indicators continuously monitor some of most the important parameters in your pond. The indicators feature a large, dual-level, backlit LCD to give you instantaneous readings of the parameters selected including pH, EC or TDS and temperature, even from a distance. A range of spare probes are available if required together with many other water measuring instruments. If you cannot see the particular meter on the web site that you are looking for, please do not hesitate to ask. Healthy Koi are pleased to announce that we are now offering free shipping on orders of £75.00 and over to mainland UK. For more details on our shipping policy – please click here. Unfortunately, with the warmer weather which we have had this year, we have already been involved in the South with four KHV outbreaks. There may also be more in our region which have been undiagnosed. Unfortunately, this outbreak seems highly virulent and has resulted in high mortality rates in the infected ponds. We are therefore advising Koi Keepers to take precautions to minimise the risks of introducing KHV to their ponds. The clinical signs of KHV can vary from year to year, but the most common symptoms this time are necrotic gills, heavy mucus on the body, intermittent periods of lethargic & erratic behaviour and a high rate of mortality. KHV usually occurs between 18°C to 27°C and only carp are affected. Should you experience any of these symptoms, don’t panic as there can be other ailments which result in these symptoms. If you have a problem, it is possible to test for KHV, using the PCR (polymer chain reaction). If you need advice, give us a call and we can talk you through the events you’ve experienced. Given that the weather has only recently got warmer, the likelihood is that the outbreaks of KHV will continue. We urge everybody to apply the highest possible biosecurity precautions when purchasing new Koi or dealing with your existing stocks. New Koi should be triple heat cycled in quarantine before being offered for sale. In our opinion this procedure, along with separate independent quarantine systems, thorough cleansing of hands and shoes between systems and separate equipment for each quarantine system is essential for any Koi dealer or supplier to have in order to be ‘biosecure’. These procedures are already in use by many reputable Koi dealers and therefore it is still possible to buy healthy Koi. If you are concerned about buying new Koi and introducing them to your pond, we recommend that you speak to your Koi dealer first. If you require any assistance or advice, please do not hesitate to contact us. Healthy Koi have just opened their new premises near Emsworth, Hants. Here, customers are welcome to come and visit us. Take time for a chat, a coffee and browse through our diverse range of products and equipment. In addition, to our range of Hanna water testing instruments and single & binocular microscopes we carry a full range of Kusuri & LFH medications and topical treatments. You will also be able to choose from a large selection of foods from Saki Hikari, Hikari, Tetra, Kusuri, Medicarp, Nobori and Yamatonishki. Other items kept in stock include pumps, UV’s, skimmers, sieve, filters, pressure pipe & fittings, valves and much more. The premises are located at Unit 11c in the Wren Centre, Westbourne Road, Westbourne, Nr. Emsworth, Hants, PO10 7SU. If you wish to visit us, please give us a ring first in case we are all out working ‘pondside’, which can occur occasionally. All our landline and mobile telephone contact numbers will remain the same. Healthy Koi has just launched its new website. The former website has been replaced and expanded to give you more information to assist you with looking after your Koi and what to do when problems occur. The site outlines Koi disease diagnostics, common parasite identification, Koi treatments, maintenance plans and KHV. It also gives a brief description of the work we undertake and gives examples of our core services. In addition, the products side of the business has been upgraded with the provision of e-commerce facilities. This allows us to use an automated shopping cart and will speed up the placement and confirmation of orders, and the receipt of goods. For those of you who prefer the traditional approach, we will still be taking orders by telephone. Alternatively, customers will be welcome to visit us at are new premises, near Emsworth, Hants, for a chat, coffee and a browse through our diverse range of products. However, please phone first in case we are all out on pond-side visits. Healthy Koi are pleased to announce that they will again be attending the South Hants Koi Show this year. Reputed to be one of the UK’s top regional Koi shows, the South Hants 18th Open Koi Show will be held again at the Havant Leisure Centre, Civic Centre Road, Havant on Sunday 24th May and Monday 25th May, 2009. The Show, which opens to the public from 10am until 4pm, will host an exciting range of Koi trade stands and craft stalls and will include bonsai & aquarium displays. The ‘Harry Potter’ Owl will be there and you will have the opportunity to be photographed with this stunning creature sitting on your shoulder. In addition to our water quality management and bio- security roles, we will again be having our trade stand and our enthusiastic and friendly staff will be in attendance to help you with any queries that you may have on Koi health matters, care, welfare and Koi diseases. Our stand will include a full range of Koi health products including a new range of top value secondhand serviced microscopes, water test meters and reagents, medications, topical treatments, swabs and many other interesting items, at special show prices. You will have the opportunity to look at the new Hanna 2008 C203 multimeter with improved accuracy. Should there be any specific items you are interested in, please do not hesitate to give us a phone call on 01243 572762 in advance and we will ensure that these will be available for you to look at on show day. Healthy Koi are pleased to have been invited to give health related talks to three Koi clubs this spring. We undertake these events in the spring and autumn to help improve the health and welfare knowledge of the Koi hobbyist. They are enjoyed by all who attend. Start: 7.30pm, Venue – Titchfield Parish Room, High Street, Titchfield, Hants. The two ‘general’ seminar will cover all aspects of Koi Health including disease diagnostics and recent developments in testing technology. The specific ‘’Advances’ talk will go into the changes in greater depth. A small trade table will be set-up at the venues for the first & third seminars. This will display some the range of products including the new Hanna 2008 C203 multi-parameter water testing instrument. If there is anything in particular you wish to see, please let HKL know in advance on 01243 572762 and they can bring it along to the meeting.